One of the red-light camera setups (left) at Queen and Geary in Albany. Albany and other cities could use their red-light cameras to also catch speeders under a bill pending in the Oregon House. But the sensors at Queen and Geary may not be accurate enough for speeding tickets to stand up in court. The bill is HB 2409. Its sponsors include Rep. Andy Olson, R-Albany, and Sen. Sara Gelser, D-Corvallis. The House Judiciary Committee, on which Olson serves, held a hearing on the measure last week. 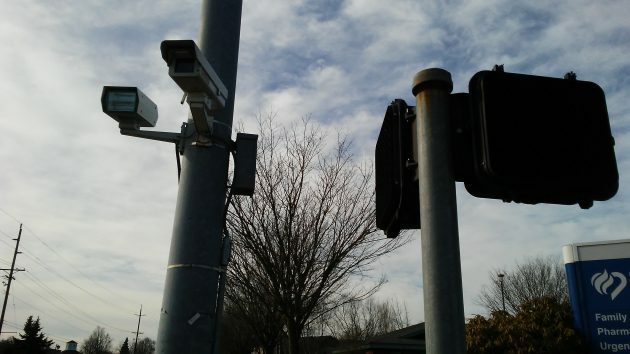 The measure would authorize any city to operate cameras mounted on poles or anywhere else to record drivers that exceed the speed limit by 10 mph or more. It is specific in saying that cities can use their red-light cameras for that purpose. But it also says they can set up cameras to catch speeders anywhere. It’s not clear, but the context suggests that the authorization refers only to cameras tripped by sensors in the pavement. Existing law already authorizes Albany and nine other cities — not including Corvallis — to operate “photo radar” to enforce speed limits. Photo radar doesn’t need sensors in the ground. I asked Albany Police Chief Mario Lattanzio whether the red-light cameras at Queen Avenue and Geary Street — the city’s only ones — could be used for speed enforcement too, and if Albany was interested in that idea. At the Feb. 16 hearing, the Judiciary Committee received testimony in support from the cities of Medford and Portland and from the Street Trust, formerly the Bicycle Transportation Alliance. Medford Police Chief Randy Sparacino said some drivers will speed up before an intersection to keep from getting caught by the red-light cameras. “Their speed can lead to accidents with other vehicles, pedestrians and bicyclists,” he wrote. Anybody who breaks the law should be cited. Period. Case in point: Drive the exact speed limit around town, or on the freeway, and see what percentage of people pass you. On the freeway, they usually tail gate you first, then pass you. Regarding bike riders. Do they come to full and complete stop at every stop sign? I fear that Hasso would be cited multiple times on each bike ride. But please Hasso, if I am wrong tell me. And in case it is not obvious, I am obviously against such enforcement of the law. Many, many laws are not created for strict enforcement, rather are meant to be applied with discretion, with circumstances taken into consideration. An open question: Are we inching towards Nineteen Eighty-Four? In terms of surveillance and lack of privacy, we’re pretty much there already. And it’s all our own doing, giving in to the temptation of technology. Albany had wanted to put up cameras everywhere in Albany, along Pacific and Santiam. They state said they could use some of that revenue. No no no, Albany didnt want to share. State hiways belong to the State and any revenue they generate will include a hefty partion to the state. That also means State police are not out of their jurisdiction to pull someone over on highway 99 or 20. Albany decided not to partake in that activity. And settled with Queen and Geary I think the police on bicycles are pretty effective but I dont know. The real reason that the cameras were installed only at Queen and Geary was that this is an intersection of city streets. On state highways, such as Pacific and Santiam, there were many more requirements that had to be met before red-light cameras were allowed. That’s my memory, anyway. I had to wait a day for the “get the government out of my life” crowd’s response to this article, but i knew it would come. This is from a mature adult who has not had a ticket in the last 40 years. Why would we have an objection to a person being penalized for hurling a 5000 pound projectile toward us as they run a red light or violate the posted speed limit. Their behavior is no different than pointing a gun at my head and the heads of my loved ones. We have technology that can turn the lights on or off from our phones, but reject the technology that keeps errant behavior in check…really! !